MANILA - The Philippine economy picked up more than expected in the third quarter as strong domestic demand kept it relatively insulated from the global downturn, reducing the odds of an interest rate cut in December. A sharp jump in third-quarter farm output and a late rebound in exports also contributed to the economy's 1.3 percent growth rate in the July-September quarter from April-June, which was three times as fast as economists had predicted. Like many of its Southeast Asian neighbors, robust domestic consumption and higher government spending have helped cushion the Philippine economy from the worst of the global slowdown, while manageable inflation has allowed Philippine authorities to keep interest rates accommodative for growth. The Philippines, once known as "the sick man of Asia", posted the second strongest annual economic growth in Asia in the third quarter, lagging only China. "We are well on our way to surpassing our growth target of 5 to 6 percent this year," Arsenio Balisacan, economic planning secretary, told reporters on Wednesday. With the way the Philippine economy is growing, we are poised to overtake Singapore next year. Ang problema ay ang susunod na uupo sa pagka presidente. That is 3 years from now. That is why it is crucial always to select for good leaders. The demographical sizes of the countries compared, like the population size, has also alot of significance to this GDP ranking. What is more important as an indicator is for instance the GINI. I bet my as that the Philippines are ranked much lower than Singapore in that sense. After the investment grade awarded by Fitch, it seems like another credit rating agency is preparing to award another one. Isa na lang, kompleto na tatlo in giving the Philippines the investment grade! MANILA, Philippines (4th UPDATE) - The Philippine economy grew by an "impressive" 7.8% in the first quarter on higher consumption, manufacturing and government spending, according to the National Statistical Coordination Board (NSCB). 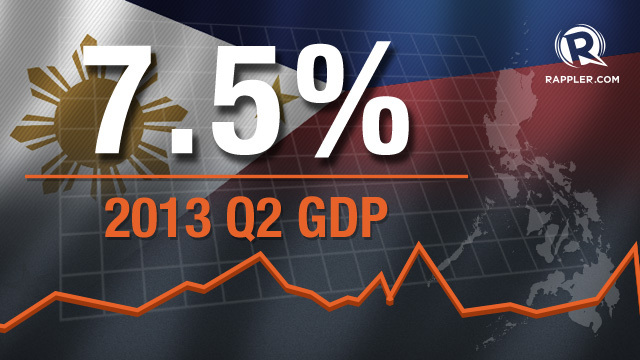 This is faster than last year's 6.5% growth and the previous quarter's revised 7.1% expansion. Socioeconomic Planning Secretary Arsenio Balisacan said the figure is the highest so far among the major East and Southeast Asian economies, particularly Indonesia, Thailand, Vietnam and China. In the first quarter, Indonesia grew by 6%, Thailand by 5.7%, Vietnam by 4.9 and China by 7.7%. The Philippines continued to exceed expectations and remained the fastest-growing among emerging economies in the region, the government on Wednesday announced. The country’s gross domestic product (GDP) expanded by 7.5 percent from April to June, faster than the 6.3 percent growth it posted in the same period in 2012, official data showed.